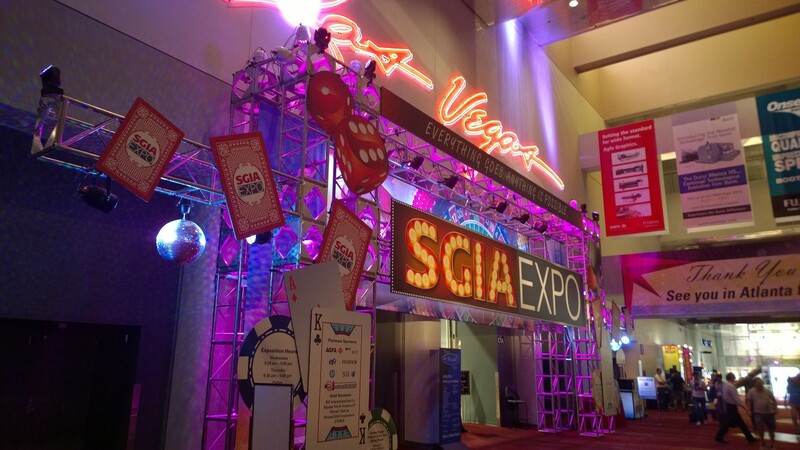 A few weeks ago, I attended SGIA Expo 2014 in Las Vegas with some of my colleagues. This was my first trip to SGIA, and let me tell you what an adventure this was. The Hall at the Las Vegas Convention Center was buzzing with activity well before we arrived and still after we left. 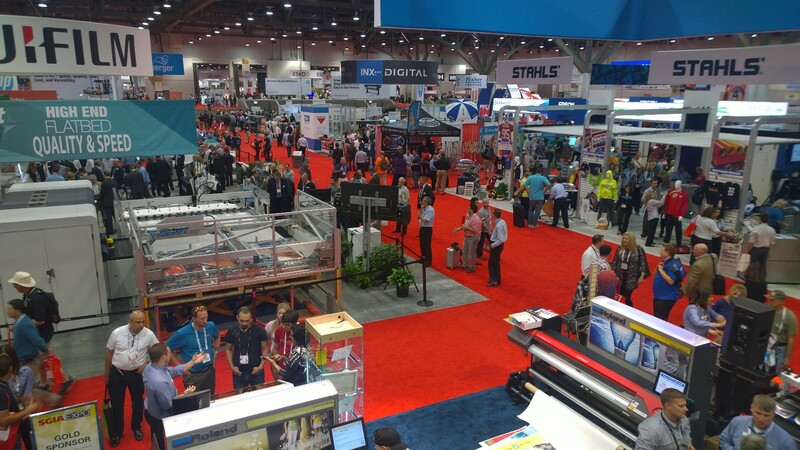 According to SGIA.org, the Expo had record attendance with over 25,000 registered attendees. This is not at all surprising considering the number of people that came to see us to say hello, ask questions or share their experience with our products for many years. There was an infinite array of new ideas, technologies and innovation. From furniture made from corrugated cardboard (printed and cut), to stunning imagery printed on fabric, to the designs engraved on wood, glass or metal. The list goes on. There were so many unique things to see. I was quite impressed by the automatic screen printing presses, some capable of pressing more than 16 colors at the same time and producing over 1,500 shirts per hour. Talk about mass production! On the other side of shirt printing, and equally impressive, are the DTG (Direct to Garment) printers. While screen printing relies on the same design split into colors and repeatedly applied to the shirts, the DTG process introduces the convenience of printing the full color image in fewer steps. The DTG printer can, with very little set-up, produce one-off designs as fast as it can reproduce the same one on many shirts. This makes it perfect for smaller runs. Not all technologies at the Expo were new. Some have been around for many years and are still as impressive as ever. I have always been a fan of laser engravers, and SGIA did not disappoint me in that respect. I was very impressed by the beautiful and detailed engravings on plastic, wood and metal. The precision of the engravings and the fine detail astonished me. I also had the pleasure, along with my colleges, to introduce Corel DIGITAL SIGNAGE, a solution for small business looking to add digital signage in an easy and cost-effective way. This drag-and-drop, completely cognizable solution will have your digital displays up and running in a few minutes. The program has hundreds of templates to choose from, making it easy to customize messages to fit a certain brand. With web based management, you can do it all from your desk. SGIA was a fantastic experience and I am glad to have been part of it. It made me even happier to be a part of CorelDRAW, the unparalleled leader in the sign market. Just as the many attendees who came to visit, ask questions or just to say hello. If you were at the show, and you stopped by the booth, we cannot thank you enough for taking the time to visit us. You can find more pictures from SGIA 2014 on our Facebook page! Were you at SGIA? What was the highlight of the Expo for you? I am a Quality Assurance specialist working on CorelDRAW, making sure that vector and bitmap print alike. I’m also an avid photographer who enjoys capturing everything that moves but especially what does not. For me, photography has been an 8 year journey with no intention of stopping. This entry was posted in Graphic design and tagged Corel, Corel Digital Signage, CorelDRAW, Printing, SGIA, SGIA Expo 2014, Sign Making. Bookmark the permalink.